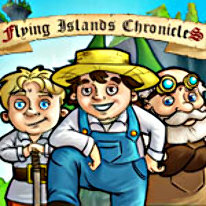 Save the residents of flying islands from robots gone mad. At the very edge of one of the flying islands there lived a typical farmer, dreaming of a rich harvest. But his dreams were interrupted by giant cogwheels falling from the sky directly into his garden. The farmer vowed to do everything in his power to find out who or what caused the ruin of all his crops. It turned out that robots, having been designed by the realm’s finest masters and having served humanity for many years, have suddenly gone mad and are now bent on death and destruction. Now the farmer and his friends need to figure out what exactly had gone wrong and restore peace in the kingdom. Repair ruined buildings, recruit soldiers and engineers, and explore magical islands. Only you can help your faithful friends find what they’re looking for and defeat the wicked Emerald Master.